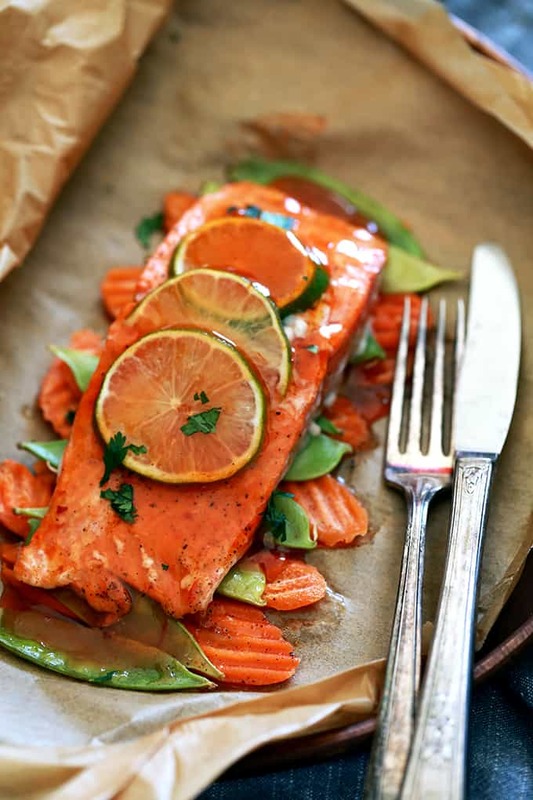 This Thai Sweet Chili Glazed Salmon in Parchment recipe is ready to eat in just 20 minutes and is more like a method of assembly than an actual of recipe. A salmon filet is placed atop a bed of carrot chips and snow peas before being garnished with slices of lime and glazed with thai sweet chili sauce before being wrapped in a parchment pocket and baked. When someone asks you what you want for dinner, I’m guessing one of the last things you’d ever request is salmon. That is unless that person asking is a waiter and you’re sitting in a restaurant. But guess what? I’m about to change all that! My Thai Chili Glazed Salmon in Parchment is ready in just 20 minutes and even better, you can eat it at home in your sweatpants instead of dressing up to head to a restaurant. Don’t worry, I won’t judge. This isn’t my first time creating a recipe that highlights delicious thai flavors. You love my Slow Cooker Thai Chili Peanut Meatballs and on a rainy day like today (the fourth consecutive rainy day! ), my Thai Chicken and Coconut Soup totally hits the spot. And don’t forget my addictive Thai Glazed Cashews which are a copycat of my favorite Sahale snack mix. If you haven’t tried cooking in parchment before, prepare yourself for a complete game changer. Cooking “en papillote,” the French term for “in parchment,” means that everything steams inside the parchment packet while in the oven. It also means less mess as you’re simply assembling everything within a piece of parchment and then placing it on a baking sheet before sliding it into the oven. 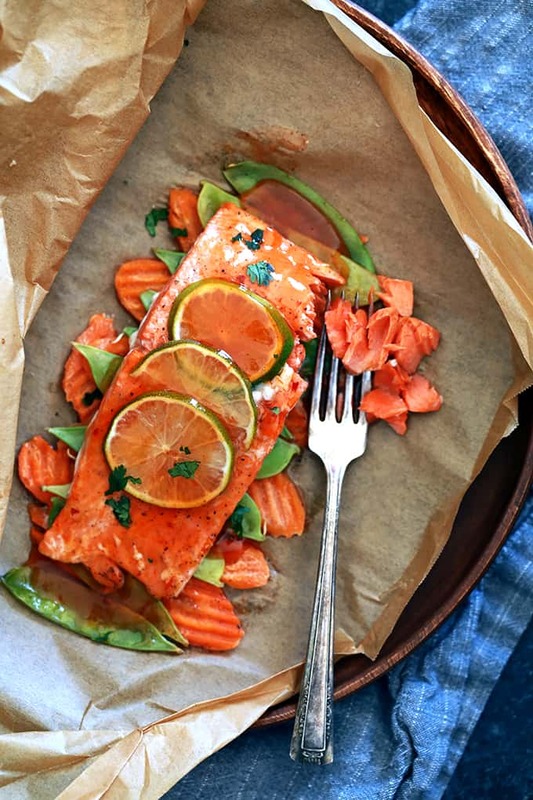 Best of all, you can make this Thai Sweet Chili Glazed Salmon in Parchment ahead of time and refrigerate for several hours, then bake when you are ready for dinner. Perfect for an easy and delicious weeknight meal but also completely suitable for entertaining when you’d rather be spending time with your guests instead of camped out in the kitchen. 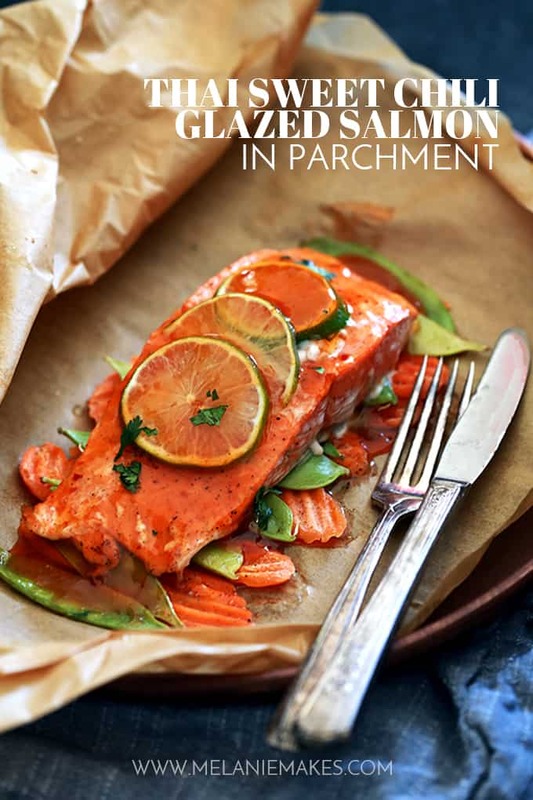 This Thai Sweet Chili Glazed Salmon in Parchment recipe is more like a method of assembly than an actual of recipe. Have children at home? They’ll love helping to prepare these! A salmon filet is placed atop a bed of carrot chips and snow peas before being garnished with slices of lime and glazed with Robert Rothschild Farm’s Thai Sweet Chili Sauce. That’s my shortcut to making this meal so quickly! This sauce stands out from the crowd as it uses Piquanté™ peppers. Sweet yet tangy, with just a hint of sea salt, this well-balanced sauce is not only delicious, but a terrific timesaver. I’m thinking Robert Rothschild Farm’s Thai Sweet Chili Sauce would also be a great shortcut for these summer ready Sweet Chili Thai Peanut Hotdogs, holiday worthy Sweet Chili Garlic Glazed Ham and this incredibly easy Sweet Chili Pulled Pork. To make parchment packet, cut a piece of parchment approximately 18? long. Fold parchment in half to make a 9? x 15? piece. Then, cut a wide, fat half-heart shape with scissors. Place carrot chips on the bottom half of the parchment. Add snow peas in a single layer over carrots. Drizzle 1 tablespoon of Thai Sweet Chili Sauce over snow peas and season with salt and pepper. 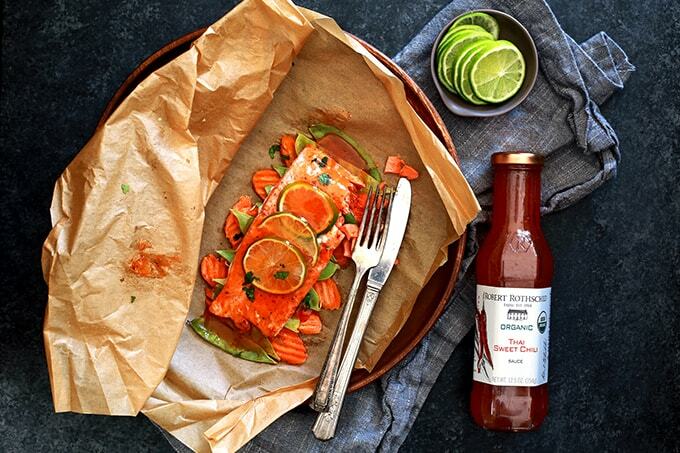 Place salmon on vegetables and drizzle with an additional tablespoon of Thai Sweet Chili Sauce. Season with additional salt and pepper and top with lime slices. Starting at the top of the parchment's heart shape, seal packets by creasing and folding every few inches around the heart, creating a tight seal so the packets will steam. Remove from oven and unwrap parchment. Top salmon with remaining tablespoon of Thai Sweet Chili Sauce and garnish with cilantro. First I can't believe I have never tried that version of Sahale snacks! I am soo guilty of taking one flavor and using it in multiple dishes. 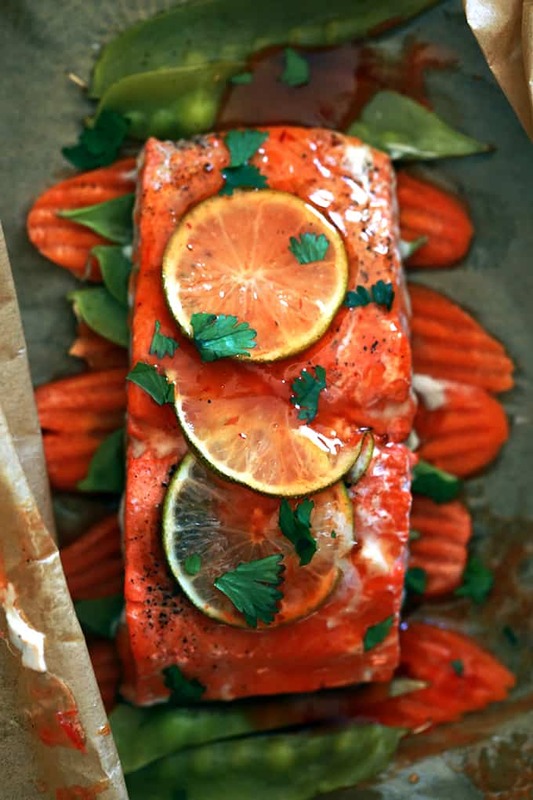 This salmon sounds wonderful! Oh, Lauren, those snacks are addictive! These days I was just thinking a new recipe for salmon. This one is perfect! Hope you'll give it a try, Catalina! 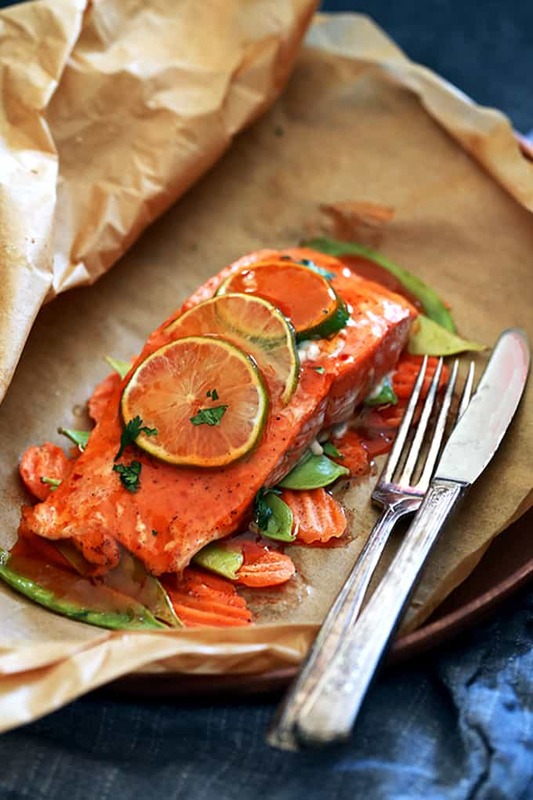 Salmon is one of my favorite proteins to use! This recipe looks amazing! Salmon is a staple around our house. We are always excited to try new ways to enjoy it! This looks great! I bet the sweet and spicy flavors in this are spot on! Oh my gosh the flavors on this dish sound so amazing!